On January 11, 1963, the Carl Sailer Family made a gift of a parcel of land to the Archdiocese of Los Angeles. This land consisted of approximately eight acres located at the southeast corner of Cochran and Stow Streets and was to become the site of St. Peter Claver Catholic Church. On October 19, 1972, Reverend James F. McKeon, was officially notified that the parish of St. Peter Claver was to be Canonically erected and on November 10, 1972 was officially opened. The Rectory, a residential house, was purchased in late 1972 and made ready for occupancy by December, 1972. In January 1973, the first “social” took place. Families of the new parish gathered for an “Open House”, bestowing many household items to help furnish the Rectory. With no permanent facility for church, Fr. McKeon approached the Simi Valley Unified School District and received approval to hold Masses at Simi Valley High School, as well as Religious Education Classes which begun in September 1973. As our parish family grew, Masses were also held at the Knights of Columbus Hall located at the corner of Stow Street and Los Angeles Avenue, and also the Presbyterian Church on Cochran Street. The first ground-breaking took place Sunday, June 30, 1974. The multi-purpose building would consist of a church to seat 350 people with a large open area beyond the pews for extra seating when the mobile walls were opened up. When those walls were closed, the area would serve as classrooms for Religious Education classes. Construction began in late 1974 and was completed in mid-1975. Ground-breaking for the church took place on May 26, 1996 and preparation of the grounds for construction began July 2, 1997. The Dedication Mass of our permanent church took place on August 29, 1998. His Eminence, Cardinal Roger Mahoney led the dedication with Monsignor Gary Bauler as the Pastor. Ground-breaking for the Preschool, Kindergarten and Youth Center took place on June 13, 2004. Dedication of the School and Youth Center took place on May 11, 2008 following the 12:00 noon Mass, celebrated by Bishop Thomas Curry. The first summer preschool session began in June of 2008. The first Kindergarten class celebrated their graduation in June 2010. On November 10, 2012 the Parish Pastoral Council sponsored the Mass and dinner in celebration of the 40th Anniversary of its foundation. That same year, Msgr. Gary Bauler retired and Fr. Riz Carranza was appointed as the new pastor, July 1, 2012. 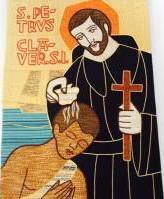 The history of St. Peter Claver Parish from the day it was founded until present time is a reflection of the many dedicated people giving of their time, treasure and themselves to create the happy, hospitable, loving parish and school we know today. Our parish continues to strive to be that place that you can call your spiritual home, always mindful of the wonderful accomplishments of the original parishioners, who will remain an inspirational example to follow.